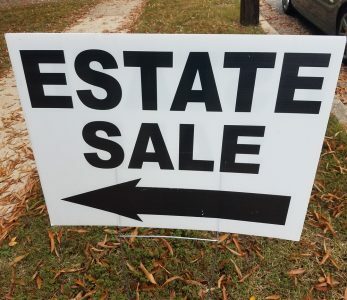 We’ve all probably driven through neighborhoods and seen estate sale signs numerous times. They seem to be almost as prevalent as garage and yard sales. But you may not have given estate sales much thought– until you experience the need to organize one yourself! 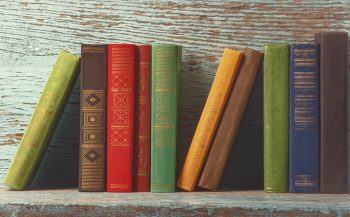 The usual reason for an estate sale is brought on by a death and the need to sell off a person’s possessions all at once. Selling off possessions is part of paying debts, liquidizing assets, and settling someone’s estate after their death. 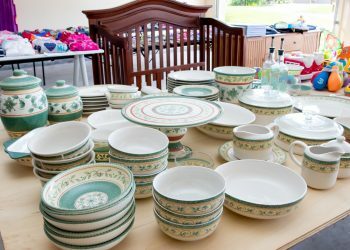 With the sheer amount of stuff left behind as part of someone’s estate, organizing an estate sale can be a pretty daunting task. 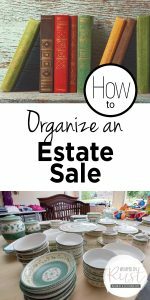 So here are some helpful things to know when you need to organize an estate sale. Walk through the home and write down everything! 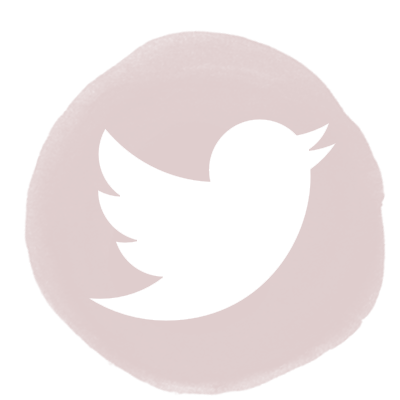 This is otherwise known as an inventory, and you need one to help track what you’re going to do with it all. Note the items that are designated for someone else and will not be sold. Set up a time for everyone to come and claim these items. It helps to notify them that if they don’t pick up their items by such-and-such date, the items will be included in the estate sale. Be firm about the dates you set! You should also note any items that are not worth keeping. Some will be great donation items, and others will be destined for the trash. Load up donations, and either deliver them or request a truck from the non-profit to come and pick them up from the curb. If there a lot of items that will be thrown out, it’s extremely helpful to acquire a dumpster. Have one delivered to the driveway for a set period of time, such as a week. During that week, get help to remove everything from the home that is to be tossed into the dumpster. At the end of the week, the dumpster rental company will come and take it all away for you. I’ve done this before and it’s so helpful. You just have to separate the emotions from the junk. Now that the junk items and donations are taken care of, you can focus on the estate sale. Clean up and fix any items you can, because that may significantly improve their value. Pricing items can be the hardest part of organizing an estate sale. Do some research online, visit antique dealers, etc., to get a fair idea of the value of items in the estate. Then remember that people who come to estate sales are generally looking for a good bargain. If you are unsure of a higher or lower price, go with the higher price and leave room for shoppers who will try to negotiate prices down. Use price stickers from an office supply or Amazon to clearly mark everything. Use pre-printed stickers to make this job TONS easier! Think about the walk flow through the house, and set everything around the perimeters of rooms to make it easier for people to move through. If there are any non-sale items that will still remain in the home during the sale, clearly mark them so there’s no question about it. You’ll save yourself having to repeat, “That’s not for sale” a billion times! Security is very important. Make sure you have enough helpers to watch over stuff. Monitor the entrance and exit. Don’t leave non-sale valuables sitting around. You’ll also need helpers available to help you collect and count money, as well as to help buyers move stuff out of the house. Don’t think you can do it all yourself. Make sure you have a plan for anything that doesn’t sell. That usually means more donations, but think about it ahead of time so it’s not a surprise when it happens. The last thing to do is advertise your estate sale! Put it in the local paper, tack up some flyers, put out some large signs. The more people realize there’s an estate sale, the more successful you’ll be. For more helpful info on estate sales, see The Penny Hoarder. Dingy Whites Giving You a Headache? Take an Aspirin!